My knee jerk reaction was to sputter, ‘I just am!’ but even I knew that was not an answer. Then I realized that the question was itself a great blog post, and something I want to know about you, as much as about me. 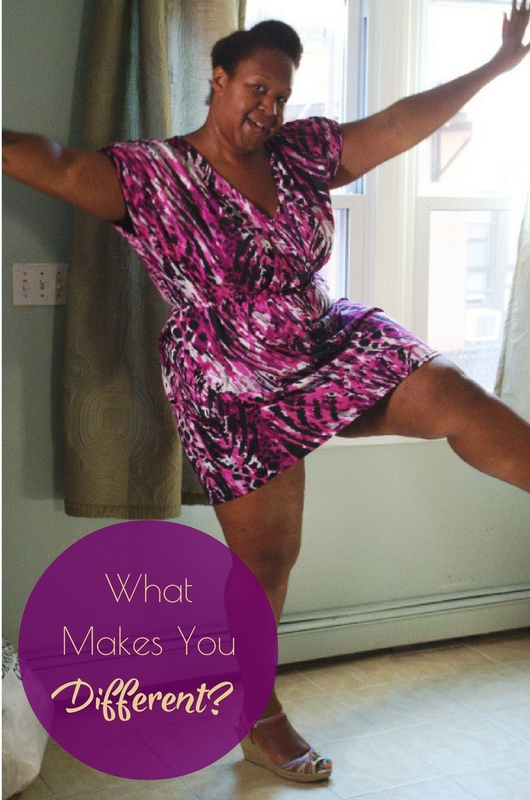 Let’s start with the physical – what is different about me is my size. I feel like King Kong among women. I’m tall: when I walk into a room, people look. When I walk into a room wearing 3″ heels, they openly stare. I’m also big: definitely from the front, whoa Nellie from the side, and dayummm from the back. But there are things I do have control over, that also set me apart. I don’t wear makeup or jewelry, I don’t paint my nails, I don’t carry a purse, and I’m always wearing sneakers. I do my hair as plainly and infrequently as possible. These are conscious decisions – that I can change at any time – but right now, that I continue to make them, makes me different. I’m a large and a bit dishevelled looking. What else? 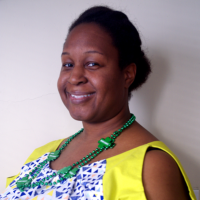 Well, I’m a body positive sewing blogger, and I’ve been thinking a lot lately about what that means. 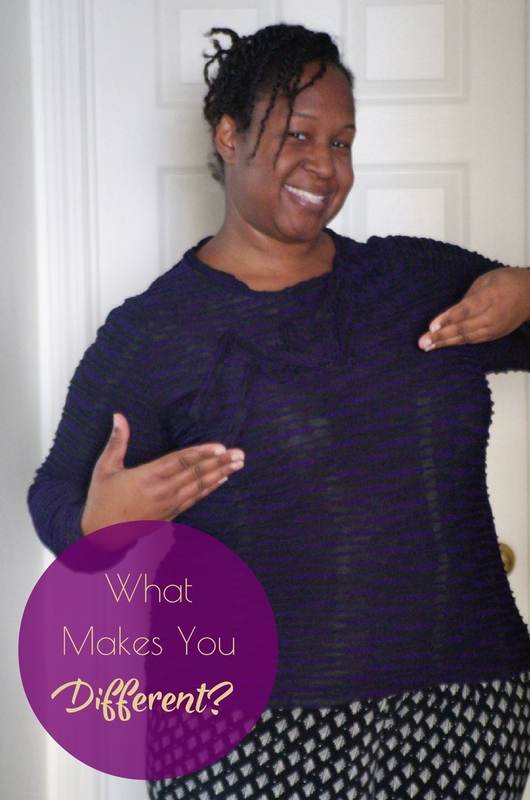 What do you think of when you hear body positivity, or body positive sewing? What do you expect to see on a body positive sewing blog? Personally, I came to body positivity when my body- and self-hatred reached a tipping point – I literally got tired of hating myself. I decided that not hating myself (not loving or liking myself, mind you, just not hating myself) was probably less exhausting, and so I was going to give it a whirl. I was 23 or so then. I’ll be 35 this year. It’s been a long journey, and I’m sure I’ve got a ways to go yet. But the point is, ‘body positivity’ would have a different definition depending on when you asked me. And now we’re back to the word ‘different’. 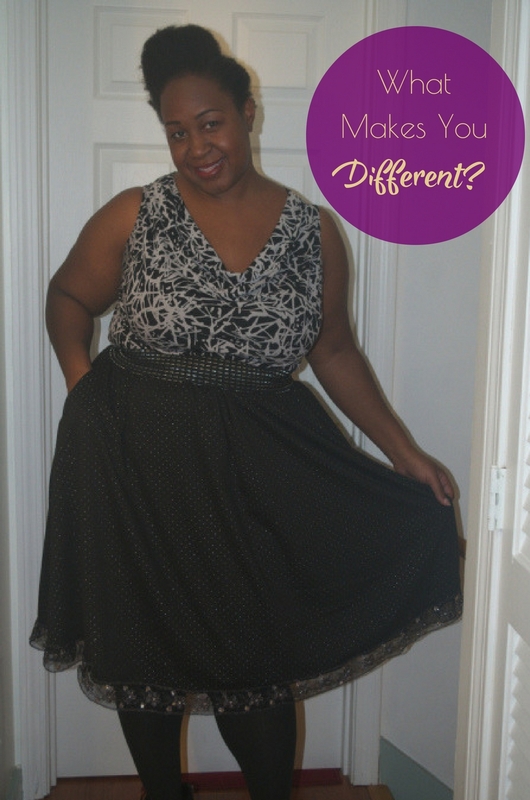 Maybe body positivity, and body positive sewing, are simply different. Maybe we’re just trying out something else, something alternative to what we know, to see if we like it. Maybe we’re A/B testing our self-image and relationship with our body. Maybe that means that different things will be ‘positive’ for each of us. Is that okay? When I was in 7th grade, our vice principal closed out the morning announcements the same way every morning. “We are all different, and different is good.” I admit to being a brat towards him then, but his words have stayed with me for over twenty years, and now I hope they’ll stay with you. I’m not sure why I wrote this post – I have a million new garments I could show you, videos and vlogs I want to make for you, and tips I want to share with you – but here it is. 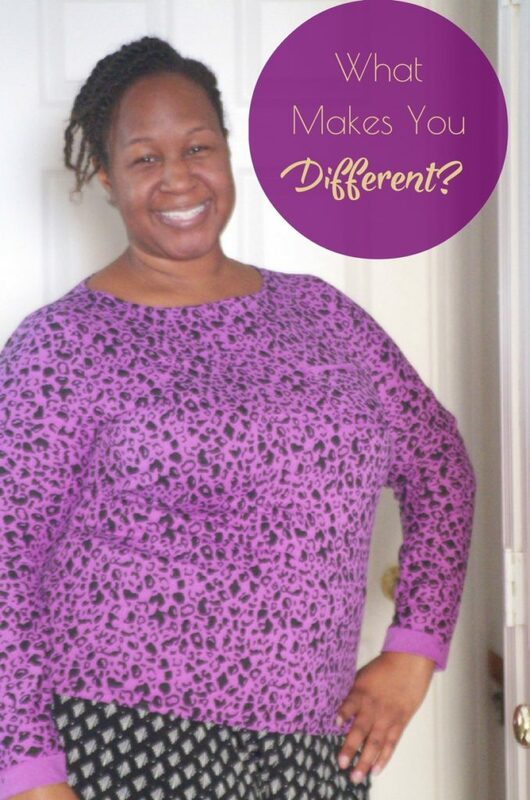 Body positive sewing is different, and different is good. 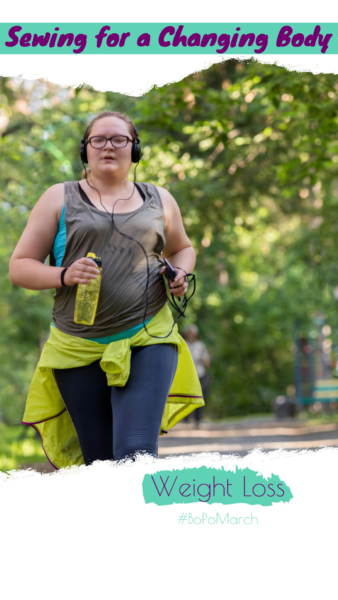 Share your differences in the comments below – they don’t have to be physical, or body positive (if you’re not ready for it, don’t force it!) – they don’t even have to be sewing related. Let’s just talk. It’s not Saturday, but let’s muse together anyway. Kidding aside; I love how you share your past and stories so openly. You really feel like a person, with emotion and feeling. Someone I’d enjoy a good coffee and a laugh with. Whoa Nelly or not; you’re just the salt from the earth this old soul has missed seeing in this world. Shine big and bright wherever you are. that’s a good question and I had to think for a while to answer it. I’ll give it some more thought and maybe I think of something else as well but the above are not usual characteristics and this small part of the map so those make me different! Hi Aida! Thanks so much for sharing your differences. #1 is huge – I absolutely wish I could see the forest. I’ve got major tree vision…sometimes it’s great, other times, well – there’s a reason people travel miles to spend time in a forest, but don’t give the tree in their backyard the same attention. I thoroughly enjoyed this post and the dialogue that’s ensued, Ebi! Thanks for the opportunity to reflect on the deep stuff. You know how I love to go there. I am attracted to DIFFERENT like a magnet. My friends and family have learned to get used to how un-mainstream I can get. We all know sewing is its own revolutionary act, but I am pretty progressive with my other lifestyle adoptions and boycotts. What makes me different are the variety of things I’ve been conscious of letting in my life and the things I consciously avoid (or let in sparingly). YES to uncured bacon and popping corn with its fat. NO to restrictive shoes (only 6 months in on this boycott). YES to homeschooling my child. NO to daily makeup (but YES to the occasional bold red lip). NO to daily news and Facebook (sewing forums are the exception. YES to reading books with real pages. NO to technology that doesn’t serve me. Yes, Najah!!! Thank you for this list of differences. :) We’re definitely going to have to talk about fatty popcorn, I’m so curious. Thanks as always for reading the blog – days late or no, I appreciate you taking the time to do so. Since you’ve known me since we were 5, id actually like to hear how you think I am different. Interested to hear your thoughts my dear!! As for you… the way you look at the world is so different from that of anyone I have ever known. Its why i adore conversations with you and reading your blog. Very cool post! I’m tall too. I used to be obsessed with not gaining weight as in my head even just barely fitting into regular clothing sizes meant I was not as different as I feared to be. I’m getting better at accepting and liking my body for what it is and just letting it be what it wants to be. I used to be on the trainers and no make-up team too, but for me that was more about trying not to stand out even more. So right now, I’m working towards not caring as much about how the world reacts to me and just doing what I feel is right and makes me happy. Thank you for being visible. I am very grateful for every woman who puts herself out there for the body positivity movement. Hi Babs! Thanks for coming over to the blog :). You’re not alone in using your ability to fit into standard sized RTW as your yardstick for ‘normal’ – never mind that manufacturers exploit vanity sizing to a ridiculous degree, and keep changing the range of bodies their clothes actually fit. I’m thrilled to hear you’re developing a relationship with your body, sans the third party. It’s so funny that you mention being plain to blend in – I had the exact convo over brunch the other day. For me, it’s more laziness and stubbornness than anything else, but the odd truth is that a plain woman actually stands out more than a ‘put together’ woman because most women don’t leave the house in sneakers and a plain face. (Ask me how I know.) I’m considering returning to beauty behaviors in a small way, just so I can blend in better. :-O :-p But I’m still working on not caring about how the world reacts to me, one way or the other. It’s hard. Thanks for the kind words, Allison! I read that in the 70s in the US, doctors gave tall girls estrogen in order to prematurely stop their growing, and prevent them from getting genuinely tall. So sad :( It’s wonderful that you discovered sewing, and making clothes that fit your perfectly good body. And I’m thrilled that you’ll pass on the quote to your daughters. It’s so important for all kids to hear it, but especially girls, as they approach adolescence. I’m often guided by two sayings. 1) What makes you different is what makes you interesting. 2) You can’t be your best without being yourself. I’m happy you got beyond any manner of self-loathing. I was a 120-130 lbs through my teens and hated my body. As I hit my early to mid 20s I’d gained 60ish pounds and was jut above 200. But I wasn’t unhappy with my new body. I just realized I was an unhappy 19/20 ish year old and being thin had zero bearing on how I felt about ME. I just had to learn to be happy with the skin I was in! You are NOT disheveled! LOL! 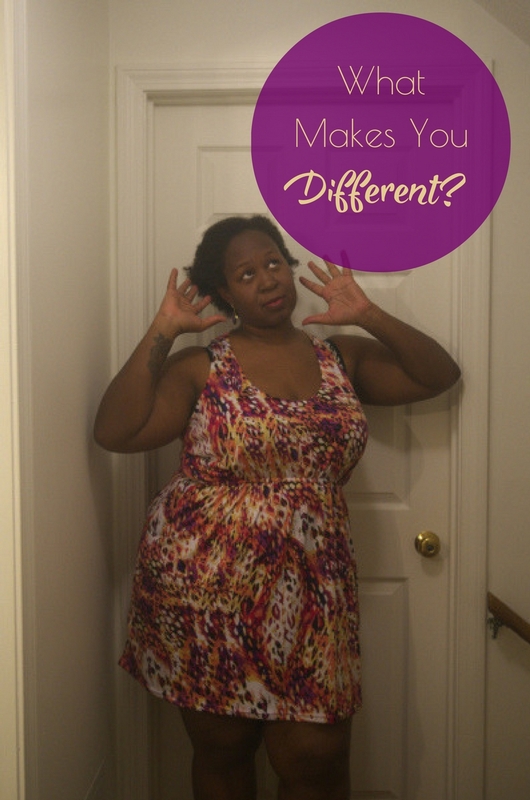 What makes me different? I feel like a big list of opposites sometimes! I’m generally quiet and reserved (especially to others!) but I have a TEMPER. I’ve tempered it (har, har) since my younger days but it’s there. I really have full command of the whole spectrum of emotions but I do not act or make decisions from an emotional place. I am logical and analytical, sometimes to a fault. It’s great for regulating myself and for my professional life but really hurts my personal relationships. Kisha, I am dying at your revelation! :-p Thinness definitely doesn’t equal happiness – or sadness. What’s going on in our lives and how we handle it are wayyyy more important to our state of mind. Foot size is a crazy thing…I had a manager who was a 6′ tall woman, and her shoe size was a paltry 9. What! Totally not fair. But the rest – you remind me so much of my best friend, it’s nutty. I wish you two could meet! Hopefully you’d get along, haha. She’s even in a technical field (IT, not science). But I bet that despite being similar, you two are nonetheless very different. Yay for differences!